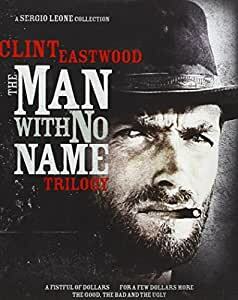 Amazon's Choice for "the man with no name trilogy blu ray"
The Sergio Leone spaghetti westerns did not simply add a new chapter to the genre...they reinvented it. From his shockingly violent and stylized breakthrough, A Fistful Of Dollars, to the film Quentin Tarantino calls the best-directed movie of all time, The Good, The Bad And The Ugly, Leone s vision elevated Westerns to an entirely new art form. 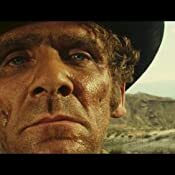 This definitive Leone collection of the most ambitious and influential Westerns ever made includes over five hours of special features that uncover buried gold in these gritty classics plus a NEWLY REMASTERED version of The Good, The Bad And The Ugly. **Deleted Scenes and much more! 3.0 out of 5 starsREVIEW UPDATED: 2014 release is same as 2010 release, with the exception of TGBU ... now sharper, darker and in yellow/teal! I will skip a review of these films, as anyone here looking at this review already knows that all three of these films are masterpieces of their genre, and must-owns on Blu-Ray. What I will review is the latest remaster for this trilogy set. I own both the 2010 Man With No Name Trilogy and the latest 2014 remastering of the MWNNT. So how do they compare? As well reported, the 2010 Blu-Ray release of TGBU was marred by some PQ issues, namely DNR was liberally used throughout the film, to wipe away some (but not all) of the grain inherent with the film stock TGBU was shot in. However, I did not find the DNR to be nowhere near as bad as some other infamous Blu-Ray titles, such as 'Predator: Ultimate Edition', 'Gladiator' and 'Patton'; for instance, actors did not appear waxy in the 2010 TGBU release, as was the case in those other aforementioned Blu-Ray releases. Overall, while far from perfect (framing is a bit off and blue push in the tint was a bit strong), I found the picture to be reasonably good-looking for a film of its age, film stock and budget. That being said, a film of this caliber cries out for an extensive remastering, à la Lowry Digital. Sans Lowry, the new 2014 Blu-Ray remaster of TGBU has, for the most part, rectified the DNR issue, with DNR being used far more discreetly this go-around. Overall, the 2014 release has a nice, crisp look; whether this is attributable to the 4K scan or the lack of DNR, I can only guess. Is it sharper than the 2010 release? At times, it is indeed ... but not always. This is not surprising to me, given the film's age and the film stock it was shot on. Still, sharpness looks very good ... the best it has ever looked on any version of home video. Also of positive note, the slight framing issue found in the 2010 Blu-Ray release has been rectified in the 2014 release. That was the good news. The bad news? Unfortunately, the remastering has also given TGBU a different color timing scheme. Now, the film's cinematography has a yellow and teal tint, with orange overtones for the actors, giving the film a more stylized look, at the expense of changing the distinctive look of the original film. In general, the colors are punchier in the 2014 release when compared to the 2010 release; too bad the punchier colors are all tinted in yellow, orange and teal. Furthermore, the 2014 version also looks darker, likely a result of lowering gamma on the remaster; a darker picture can give the illusion of increased sharpness, but it also swathes scenes in shadows that were previously quite visible in earlier video releases. Of note, according to recent reviews I have read, this new tint is what Sergio Leone had supposedly intended the film to look like, via second-hand information from an assistant cameraman who worked with the director and the cinematographer; of course, since both the original cinematographer and the director are long dead, there is no way to truly confirm this (at least George Lucas had the excuse of being alive when he started to second-guess his past work). At any rate, whatever the "intended" look might have been, this is not what the finished film has traditionally looked like since its original release ... a few Italian Technicolor prints, notwithstanding. Why do this to all of your catalog title releases, 20th Century Fox? From Alien Quadrilogy, to the French Connection, to the recent release of The R&H box set, someone over at Fox is convinced that all older films should be swathed in teal and/or blue/orange/yellow (one exception: the terrific 2014 Blu-Ray release of Rocky, also remastered in 4K, but sans alterations; see my review of it for more info). As far as audio is concerned for TGBU, the 2014 version is the same as the 2010 version, complete with souped-up sound effects. Also of note, the traditional 161 minute cut of TGBU is not included in any Blu-Ray release, including this new 2014 release; it can still only be had via the 1998 16x9 anamorphically-enhanced DVD. So to sum up, choosing which Blu-Ray version to own of The Man with No Name Trilogy is a strictly a matter of taste. Other than TGBU, the 2014 box set is identical to the 2010 release, with same video releases for AFFOD and FAFDM, with all the same extras. Which version of TGBU you prefer is what will determine your choice of releases; personally, I feel the 2010 release of the film is a far more accurate representation of the film's original cinematography than this new yellow/teal-ified version. Yes, PQ is sharper and more colorful than in the 2014 release, but that's certainly not enough for me to get past the altered look of the film. For the record, the new look isn't awful, mind you; it just makes the film look different. If you wish to have a different-looking version of TGBU, then the 2014 version is the one to pick up. In fact, for casual viewers who do not own prior releases, I will put aside my biases and recommend that they pick up the 2014 release over the 2010 release, as they will likely care about (and notice) sharpness and color saturation in PQ, more so than a change in color timing. (For more screenshot comparisons, check out "The Man With No Name" trilogy review at Blu-Ray dotcom; they loved the new remaster, FYI). For those who already own the 2010 box set and want to upgrade TGBU, save your cash and wait for the individual Blu-ray release of TGBU remastered, which will be available in the next few months. Please, 20th Century Fox ... stop the blue/teal/yellow/orange madness, and release your catalog films in their original color timing! Just commenting on the BluRay quality of The Good, The Bad & The Ugly. It was consistently good throughout the vast majority of the film. The package insert says "fully restored" and I would have to go with that but it isn't off the charts amazing. I find it much better quality than the DVD. Worth buying. Whenever you can see the intricacies of the skin on an actors face we are doing good and this has that. I wish more reviewers would comment on the BluRay quality. You have to go pages deep in reviews to find anyone who mentions it--try Erin Brockovich reviews--good luck--I gave up after 10 pages--a bunch of worthless comments. When I made the purchase I had glanced over a review saying something about improvements made to sound but I didn't give it much thought and just assumed the Blu-ray version couldn't be improved much over the DVDs I had once owned. I finally got around to watching the Blu-ray versions of Fistful of Dollars and The Good, The Bad, and The Ugly. I don't know if it's because I now have a 7.1 theater, the Blu-ray sound was dramatically improved, or both, but the Blu-ray versions of these classics are phenomenal. 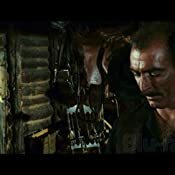 Not only are there massively noticeable improvements to the sound, but the Blu-ray version of The Good, The Bad, and The Ugly includes all of the cut scenes not on the television and DVD version I owned (ie. 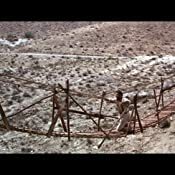 the first of which is a 5 minute scene after Tuco robs the gun merchant and is preparing a chicken and potatoes in a cave.) Some people many not care much about this but the Blu-ray menus I think are very nicely done, not cheaply done as I've seen many other DVDs do with old movies. Next time around I watch the movies with the added narration track.